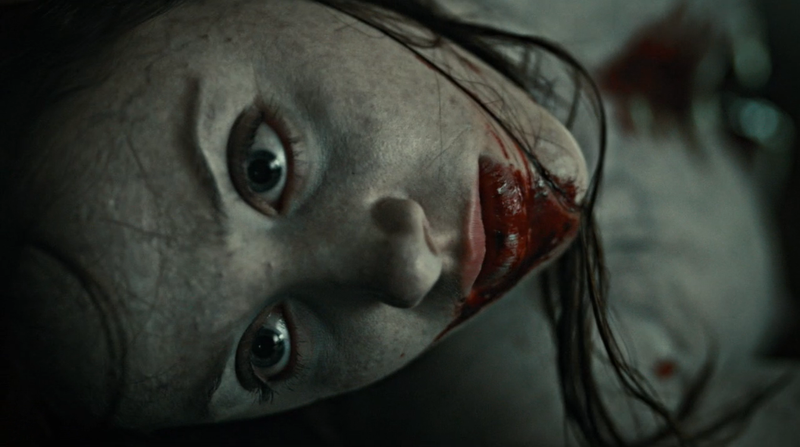 * For a review of the next episode, “Oeuf” – click here Abigail Hobbs (Kacey Rohl) has woken up. First, though, she has a terrifying dream flashing back to when her father taught her to hunt, to carve up the meat and skin the kill; all that good stuff. We see more and more the relationship between Abigail and her father as it unfolds. What the true extent is, we’ll have to wait more and find out. All the while, Jack Crawford (Laurence Fishburne) believes Abigail may have been a part of her father’s murders. In some way, shape, or form. Dr. Alana Bloom (Caroline Dhavernas) convinces Will Graham (Hugh Dancy) not to go and be the first person Abigail talks to after she wakes up; due to the fact Will was there when her father died, better yet he killed her father. In the aftermath of her father’s murders and death, Abigail begins to try and get back into a regular life. Or try to, anyways. Strangely enough, after everything that’s happened, Alana Bloom can clearly tell Abigail is a bit aloof about the entire situation. She can’t tell exactly if it is post-traumatic stress, or “suspiciously practical” as Jack puts it. 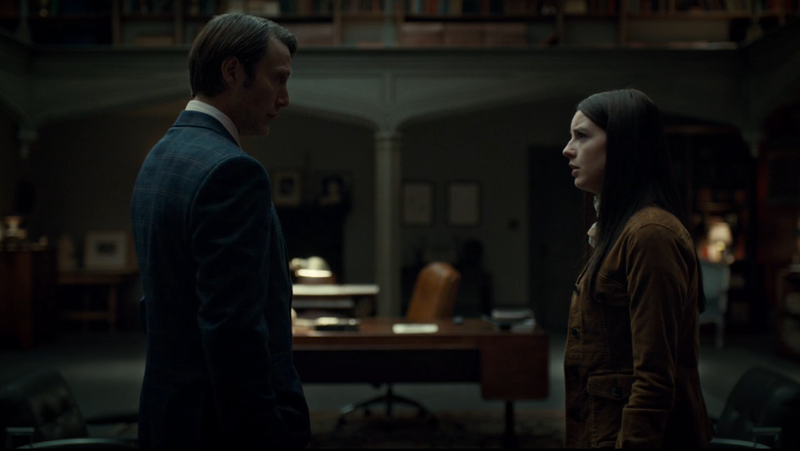 Even as Alana might believe Jack slightly, just a little, Dr. Hannibal Lecter (Mads Mikkelsen) seems to push for the girl to be treated with some normalcy. Ever the interested social scientist, Hannibal the Cannibal loves to see what will happen next should the variables in the experiment of life be changed. The part of the episode where Will is lecturing, talking about the copycat of Garret Jacob Hobbs – the Chesapeake Ripper himself strolls in as his own murder is displayed on the screen. Such a perfectly captured moment that shows us: here he is, right there, and nobody has even the slightest clue. Dig it so much because it just encapsulates the essence of the situation with those couple shots. When Hannibal walks in and there’s that image of the murdered girl, impaled on the stag’s antlers— PERFECT! Naturally, the tabloid sensation Freddie Lounds (Lara Jean Chorostecki) is still kicking around. She’s unethically gaining access to see Abigail Hobbs before the girl is out of care. While Will and Hannibal enter, Freddie is in the midst of telling Abigail that Will’s not FBI but merely a Special Agent; he helps to catch insane people because he is insane. She pushes her luck, absolutely. However, Will slips up pretty bad when he tells Freddie: “Ms. Lounds, it isn‘t very smart to piss off a guy who thinks about killing people for a living.” This, of course, stirs Jack up – worried about Will going off the leash, as if he’s the owner and Will is his pet, his ‘thing’ to use for the purpose of criminal justice. The brother of a victim killed, and most certainly eaten, by Garret Jacob Hobbs comes into the picture in this episode. It’s only natural, too. I’m glad that Fuller and Co. included this as a part of the plot because this whole angle ends up tying Abigail much further to Hannibal especially; a thread that ends up continuing, right into Season 3. 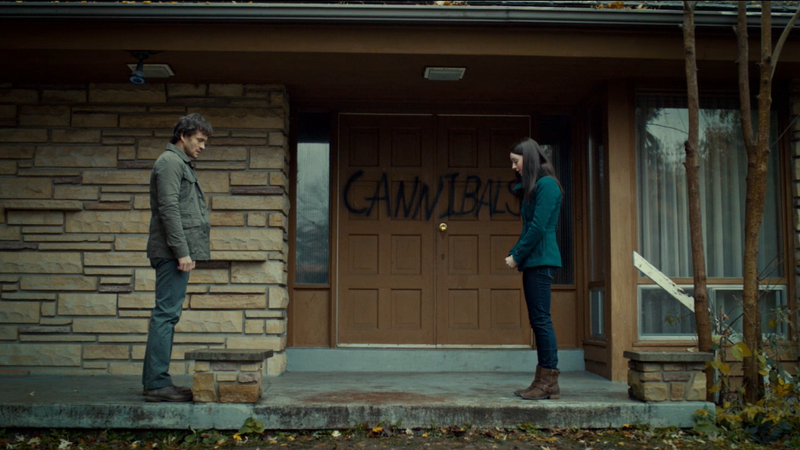 It all starts once Hannibal and Will, along with a worried Alana, take Abigail back to her house. All across the outside, CANNIBALS is spray painted. They walk around inside – right on the porch, a blood stain still etches itself across the concrete. Further on, Abigail starts to open up, the smallest bit. One large theme constantly running through Hannibal as a series is that of family. Hannibal and Will come to be like brothers; closer than friends. Here, in “Potage” it’s as if Hannibal, Will, and Alana make up a surrogate family for Abigail. She even points them all out, naming Hannibal as playing the part of ‘the man on the phone’. This is a wickedly tense moment, alongside a great score, that kicks in the chest. Hannibal is captured in a nice tight frame, honed in on him; there’s a look in his eyes, says it all. Love this scene. Again in this episode there is more to the concept of Hannibal and Will taking responsibility for Abigail. They both feel a need to look out for her, being there as her parents both died. Even Hannibal, a sociopath, feels the want to be close with people like him. We start to discover it’s very possible Abigail has a bit of her father still lingering inside her. Jack doesn’t seem to believe Abigail’s completely innocent. Though Alana and Will, and of course Hannibal, don’t believe she could have done anything with her father. Certainly not be a part of his murders. Unfortunately for Abigail, her father did feed his victims to her and her mother. Then we witness a side of Abigail that didn’t seem to evident, or possible, before as the brother of one of her father’s victims comes back. He tries to come back and explain himself about their confrontation earlier in the episode. But… uh oh — Abigail goes much too far. She guts the young guy. Fortunately Hannibal agrees to help her. He tells Abigail they can hide the body, claim self defence on her part. What most of this episode revolves around is the developing bond forming not just between Will and Hannibal, but Hannibal and Abigail. Their bond now, covering up the murder together, is something which also shapes the relationship Hannibal has with Will. Furthermore, though, Abigail fully realizes who Hannibal is and this exactly why their closeness becomes greater with every episode. She knows that Hannibal is the one who called her father at their home that day, when Will showed up and killed Garret. Now, they’ve got a bonded secret between them and there are ramifications beyond anything in the next couple episodes. There’s a long game which Bryan Fuller and Co. have in mind. I’ve seen it play out now over these three seasons, still going strong. At the time, first seeing this, I just imagined it would be some short part of the plot which played into the opening season. 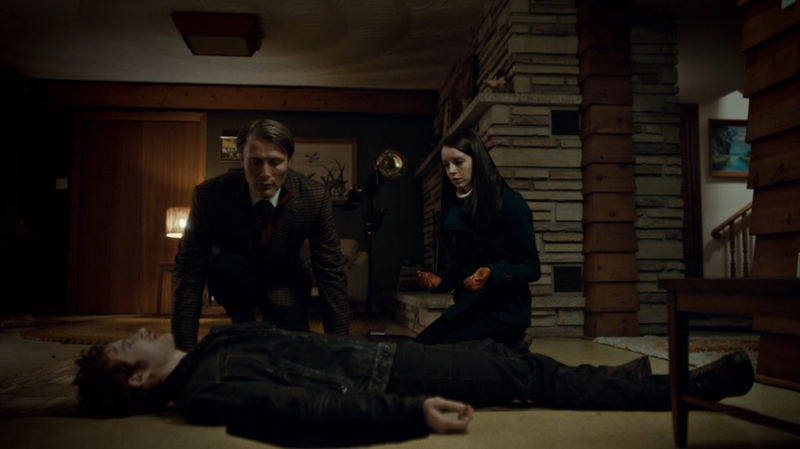 However, looking back now I can see how much of a setup this episode played for the eventual fleshed out story that becomes the web that is the triangle relationship between surrogate fathers Will and Hannibal and their surrogate daughter Abigail. Great things happening in this episode. Dark, very dark. I like how Hannibal is shown perfectly throughout this series, starting here, as the great manipulator he truly is in the Thomas Harris novels. Throughout both Red Dragon and Hannibal in particular, we see a lot of how Harris shows us the manipulative skills Hannibal possesses, and that’s a major part of why he’s, in the end, such an incredibly effective, successful serial killer. Stay tuned! Next is “Oeuf,” one of my favourites in terms of pure, full-on horror.